The weather was perfect for a morning sketching before getting back home to watch the big USA World Cup soccer game in the afternoon. I enjoyed exploring in West Seattle a bit since I live in the north end of Seattle and don't get down to Alki much. Which is one of the many benefits of the sketch outings; seeing wonderful new places around the Northwest! First I captured the beachfront, waterfront walkway (with strollers), family gatherings and the many other sketchers in my view. I have been fascinated with old metal and neon signs and so I headed to the old Homestead Restaurant for a rooftop sketch of their unusual sign. 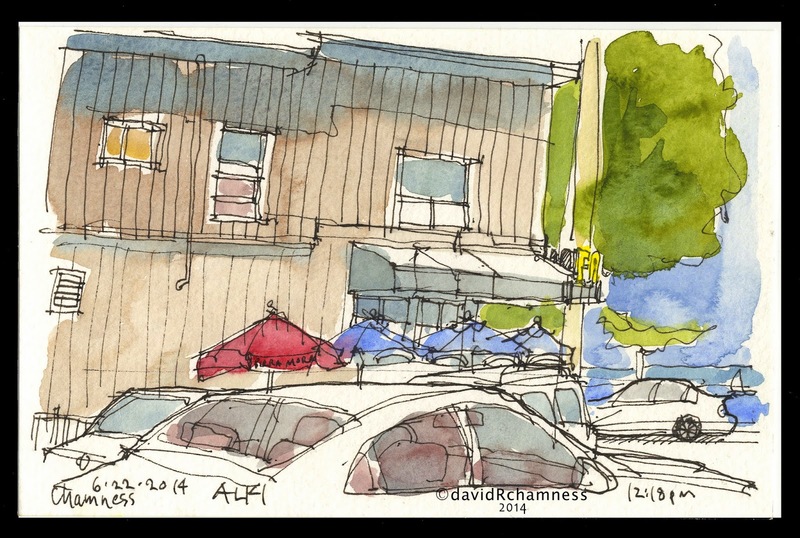 On my way back to the beach for the sharing time I stopped for a quick side-street sketch of one of the many restaurants along Alki. 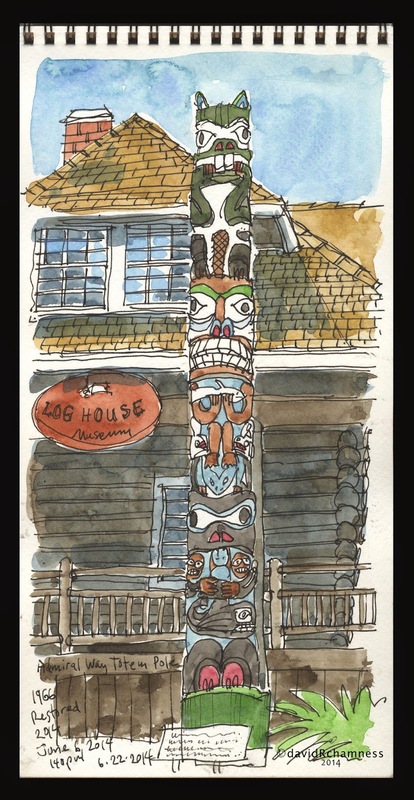 Finally before heading home I stopped to sketch the newly restored totem pole at the Log House Museum. Kay had done such a fantastic sketch that she shared when we all laid out our sketches, I wanted to sketch it also to wrap up a fun morning. Wow -- all beautiful sketches, David. You're so prolific during the sketchouts! Great series David, very much appreciate the two page layout and the people capture.